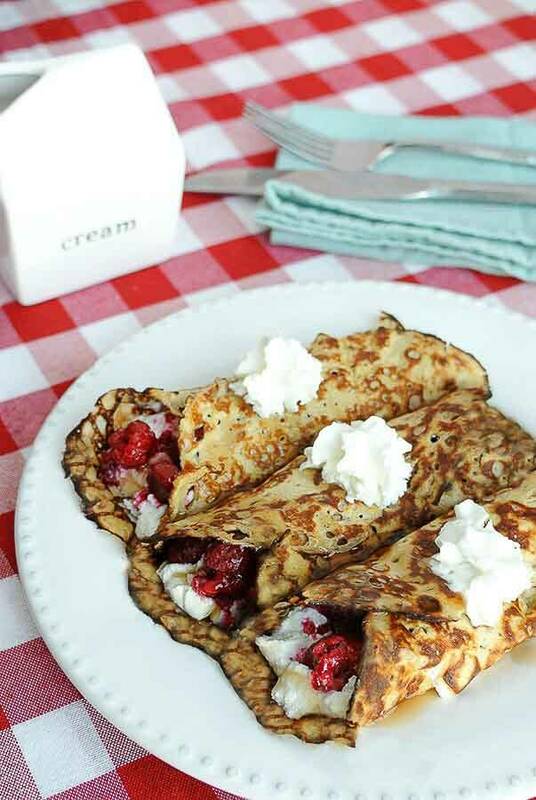 Raspberry Cream Crepes Low Carb. 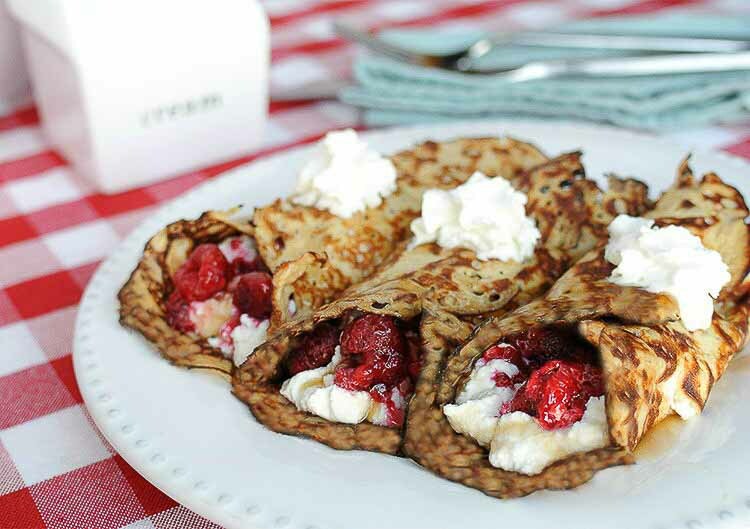 Raspberry Cream Crepes Low Carb and gluten free. Everyone loves breakfast! It’s your first meal of the day; the first bite that gives you the energy to start your day. After 8 long hours of sleeping, your breakfast is a warm welcome from the kitchen that you await every morning. Weekday mornings are tough though. Many of us settle for a quick bite or even a just a coffee to hold us over until we have a chance to eat. That’s why at Tasteaholics, our weekend breakfasts are always special. All the ideas we get for low carb breakfasts during the week we test (a.k.a. eat) on the weekends. 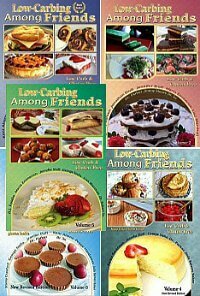 One of these special breakfasts are light and sweet low carb crepes! They’re similar to our simple pancakes, in fact the recipes are almost identical! The difference, we find, is that these crepes are difficult to enjoy with hearty items like bacon and eggs. Pancakes are more robust, while these crepes pair best with something light and airy, just like them! So we decided to fill them with fluffy, whole milk ricotta cheese and some frozen, tart raspberries. The combination was amazing! You get soft and crunchy textures, sweet and tart flavors all in one breakfast. 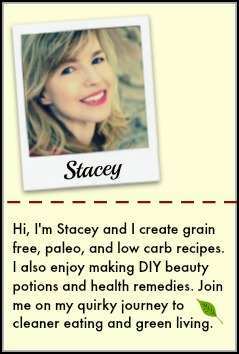 The entire recipe is 8 grams of carbs, mostly coming from the berries. Raspberries are low in sugar and high in fiber so we like to enjoy them as much as we can. Instead of springing for a sugar-free version of raspberry jam or preserves, we allow some of our carbs to come from real fruits! We enjoyed these with our Walden Farms Sugar Free Pancakes Syrup and whipped cream for extra sweetness while adding only a few carbs. You can also drizzle some sugar free caramel over top, add some sugar free chocolate chips, or play around with the berries inside. You can even swap out the ricotta for peanut butter and travel back to your childhood days of peanut butter and jelly sandwiches! What do you love stuffing your crepes with? Let us know! To make your crepes, start by combining all your crepe ingredients in a food processor, blender or Nutribullet. Blend for about 20 seconds so that there are no chunks of cream cheese left. Heat a pan over a medium heat until it’s nice and hot. Spray with cooking spray and pour on about a fourth or a fifth of your batter at a time. While you’re pouring, tilt your pan onto all sides so that the crepe batter reaches the edges of the pan creating a very thin layer of batter. Let the crepe cook undisturbed for about a minute or until you see the underside getting dark and the top of the batter setting. Then wedge a spatula underneath it, wiggling gently until it reaches the center and flip! Let the crepe cook on its other side for about 15 seconds. Do this until all your batter is gone. This recipe yields about 5-6 crepes. Let the crepes cool a bit on a plate. Don’t stack them, just lay them next to each other. Now it’s time to stuff them! Take about 2 tablespoons of whole ricotta cheese and lay it in a line in the center of each crepe from one end to the other. Now add some fresh or frozen raspberries (you can also use strawberries, but the tartness of the raspberries works well in this recipe!). Fold each side of the crepe over the filling and press gently to seal. Serve with a drizzle of sugar-free maple syrup and some whipped cream. Enjoy! 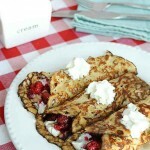 This recipe will yield 5-6 crepes and feed 1-2 people depending on how hungry they are! 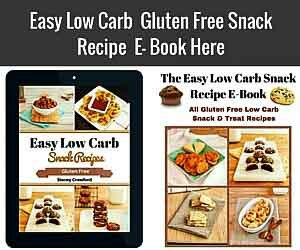 The whole recipe is 570 calories, 40 grams of fat, 15 grams of protein and 8 grams of net carbs. About Vicky & Rami from Tasteaholics! 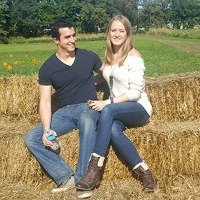 Vicky and Rami write and develop recipes at tasteaholics.com, a keto, paleo and gluten-free blog dedicated to showing how to cook easy and healthy meals. 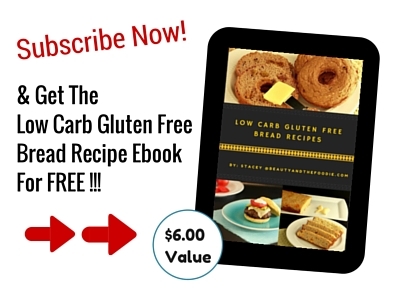 Firm believers of the ketogenic diet, they provide low carb recipes (desserts too!) that never skimp on flavor. When they’re not making a mess in their kitchen, they can be found working out together, learning Italian or discovering the next delicious restaurant in NYC. What if I don’t have erithrytol? How much sugar do I use? Hi Maria, use the same amount, as it is a 1:1 ratio with sugar. Made these for breakfast and they were so tasty and satisfying! I only had enough batter for 2 large crepes but it was quite a large pan and they both fell apart when I tried to turn them over but I think that’s my poor flipping skills. Will definitely make these again! Thank you, Bethan. I’m also hopeless at flipping crepes. I’m going to try a non-stick crepe pan next time I try crepes (fingers crossed).